By Marjorie Harris BSc, IOIA VO, P.Ag. Recent studies by the BC Ministry of Agriculture show that pesticide air blaster applicators create a pesticide residue burden of 10% concentration in the spray drift 30 feet from the application site! 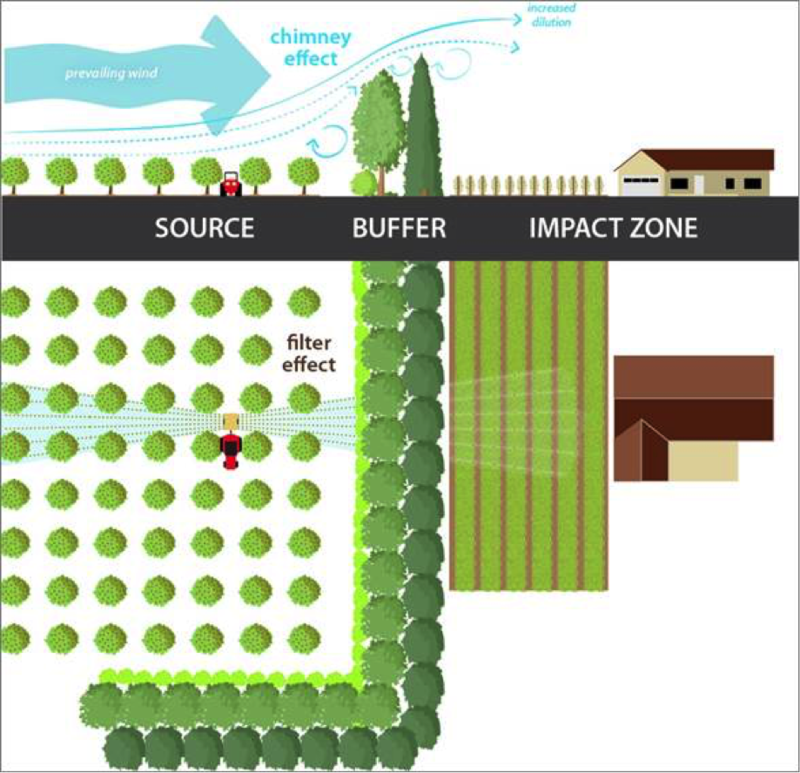 A vegetated buffer can be a multi-functional operational bonus for the organic enterprise, in addition to meeting the COR standard requirements for preventing unintended contamination by prohibited substances via air flows.The primary function of the vegetated buffer is to stop dust particulates and spray drift. Seven key features are considered in the design plan: height, density, orientation, length, width, continuity/uniformity, and cross-sectional shape. As such, trees and shrubs are layered to either trap and capture air flow by dense foliage porosity or to modify air flow into a chimney to cause dispersion and dilution. The outer vegetated buffer face can work to shield and reduce pollution from incoming spray drift, dust, and odours, while the inner vegetated buffer face can provide habitat for sacrificial crops and beneficial organisms. Windbreaks, shelterbelts, and vine covered trellis/fencing can all be designed as effective vegetative buffers to address environmental interface pollution issues. Conifer trees, especially the wild-type Excelsa Cedar, have been found to have the best type of density for providing air flow porosity, and year round protection from interface pollution of all kinds. In dry areas like the Southern Okanagan these moisture dependent hedges will require some drip irrigation and that cost needs to be balanced with the overall value to the organic operation. The inner facing surface of the vegetated buffer can be companion planted with flowering plants and shrubs to increase overall biodiversity, and to provide food sources and habitats for beneficial, birds, insects, amphibians and native pollinators. A healthy population of beneficial organisms can go a long way to increasing crop yields and controlling garden pests. A flower packed habitat will attract nectar-feeding insects such as bumbles bees, butterflies and hoverflies, which lay their eggs where there is an abundant supply of aphids for their larvae to feed on. Studies have demonstrated that alfalfa, mustard, yarrow, coriander, cosmos, French marigold, and nasturtium all attract an increase in a wide variety of predatory ladybugs. Also, consider planting native flowers, plants, and herbs to boost the habitat biodiversity for native pollinators. Often, hybrid plants with large, showy flowers have little or no pollen. One of the best plants for attracting native pollinators is hyssop. Hyssop’s strong aerosol aroma also helps to protect brassicas by masking their scent from white cabbage butterflies. Members of the mint family are favorites of Tachinid flies, hoverflies, and parasitic wasps; try planting mint, lemon balm, catnip, and pennyroyal. Todd Carnahan, author of Gardening with Native Plants, recommends the drought tolerant ocean spray brush, nodding onions, and kinnikinnick, which doubles as a great ground cover and produces red berries in the fall. The vegetated buffer will provide nesting areas for solitary bees and many other beneficial organisms. Remember to construct some rocky areas, puddles and muddy patches too catch fresh water to meet their daily water needs. The good news for those who would like to explore the value in establishing vegetated buffers is that funding is available through the Environmental Farm Plan Program to offset some of the major costs associated with risk assessment, design, and planting, making the application process all the more worthwhile. Whole farm initial risk assessment is free and completed with the help of an EFP Planning Advisor. The vegetative buffer design and plan is required to implement a vegetative buffer and is covered up to $2000. This can be completed by an EFP Planning Advisor or qualified professional. Once the plan is approved, under the EFP BMP program, producers can apply for a cost share incentive of 60% up to $15,000 for installing a vegetative buffer. A guidebook entitled Vegetative Buffers for Intensive Agricultural Operations in British Columbia will be published later in 2016. For further information about the funding program and the soon to be released guidebook please contact: David Trotter, M.Sc., P.Ag. | Agroforestry | Sector Development Branch, BC Ministry of Agriculture | p: 604-556-3148| cell: 778-549-6641 | david.trotter@ gov.bc.ca. “Create a Bee Friendly Garden”. David Suzuki Foundation. Todd Carnahan, Gardening with Native Plants. Diagram Credit Ministry of Agriculture. Boisclair, J., Lefrançois, E.. Leblanc, M., Stewart, K., Cloutier, D., et al. (2012). Preliminary observations on the potential of owering strips to attract bene cial insects. Canadian Organic Science Conference. Todd Carnahan, Gardening with Native Plants. Organic operators should adhere to the strictest possible management program in order to protect and enhance soil and water quality in the environment. Organic farmers, and others in the trade, have a commitment to environmental protection. This is a basic principle of the organic movement and must be respected before all other considerations. The theory of evolution developed by the 19th century English naturalist Charles Darwin was based on the premise of natural selection. Organisms are naturally selected for survival, competition, and reproduction by acquiring small, inherited adaptations over many gen- erations spanning millenia. In today’s world, organisms are faced with a succession of environmental challenges from habitat loss to fatal and mutagenic toxins as they grow and develop. With the rapid pace of current imposed environmental challenges, the adaptive plasticity of most organisms becomes overwhelmed and they are placed on a path to extinction. SARPAL may help to restore breeding habitat by assisting with costs associated with developing and implementing species at risk protection on agricultural lands. The on-going implementation phase will focus on achieving protection of the species at risk on agricultural lands in ways that will ideally benefit both species and producers. Currently, demonstration projects have been set out with the assistance of the BC Cattleman’s Association. The demonstration projects are focusing on two ranch land habitat species: the Yellow-breasted Chat and Lewis’s Woodpecker. The recovery strategy includes identifying critical habitat geographically and assessing the environmental features such as plants, water, and needs of the species to live and reproduce. 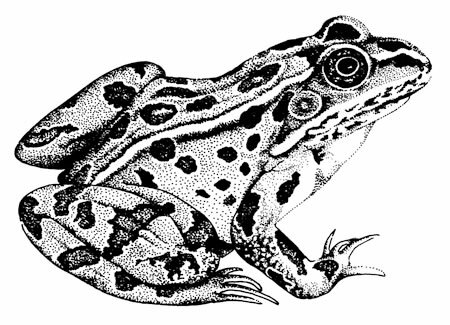 Funding is available to pay for the infrastructure to establish Best Management Practices (BMP) that protect the endangered species’ critical habitat and a Stewardship Agreement may be entered into that benefits the landowner and the species at risk. Only 40 breeding pairs are currently known of in the Okanagan/Similkameen region. The Yellow-breasted Chat prefers woodland riparian zones composed of dense tickets of wild rose and ooded oxbows.